McMurry junior Michael Limones (Burleson, Texas) ran the anchor leg of the 4×400 meter relay at the Bobcat Invitational in San Marcos, Texas that placed seventh in 3:24.96. The relay time ranks 36th in the NCAA Division III. Limones also was 24th in the 400-meter dash in 49.51 which ranks 35th in the nation. 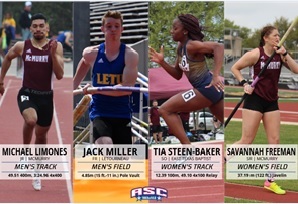 LeTourneau freshman Jack Miller (Diana, Texas) placed 10th in the pole vault at the Texas State Bobcat Invitational, clearing 4.85 meters (15 ft.-11 in.). The mark is the fourth-best in the nation in NCAA Division III. East Texas Baptist sophomore Tia Steen-Baker (Pflugerville, Texas) earned her third consecutive Athlete of the Week award by running the 100-meter dash in 12.39 seconds at the Texas Relays. At the Bobcat Invitational, she was a part of the 4×100 meter relay that placed eighth with a time of 49.10 seconds, which ranks 20th in NCAA Division III. Steen-Baker was also a part of the 4×400 relay team that had a time of 4:14.58 at the Texas Relays. McMurry senior Savannah Freeman (Mart, Texas) placed 15th in the javelin at the Bobcat Invitational with a throw of 37.19 meters (122 ft.). Her mark ranks 44th in NCAA Division III. Hardin-Simmons freshman Teddy McIntyre (Milford, Texas) placed 29th at in the long jump at the Bobcat Invitational with a mark of 6.47 meters (21 ft.-2.75 in.). He also finished 20th in with a triple jump of 12.79 meters (41 ft.-11.5 in.). UT Tyler sophomore Damarion Greenwood (Jacksonville, Texas) had the 31st-best time in NCAA Division III in the 110-meter hurdles at Texas Relays with a time of 15.33 seconds. He also ran the 400 hurdles in 59.45 and was a part of the 4×400 meter relay team that had a time of 3:25.22. McMurry senior Krystofer Campos (Knox City, Texas) placed 20th at the Bobcat Invitational in San Marcos, Texas with a throw of 15.19 meters (49 ft.-10 in.). The mark ranks 18th in the nation. East Texas Baptist senior Zack Biles (New Caney, Texas) finished 13th in the pole vault at the Bobcat Invitational by clearing 4.55 meters (14 ft.-11 in.). Concordia Texas senior Gabriel Spivey (San Antonio, Texas) won the 400-meter dash at the Texas Quad Meet in San Antonio on Sunday with a time of 49.90 seconds. East Texas Baptist sophomore Detaveon Lewis (McKinney, Texas) helped the 4×100 meter relay team post a time of 42.88 seconds at the Texas Relays, which ranks 25th in the country. He also had a 4×400 meter relay time of 3:28.31 and a 100-meter dash mark of 11.07 seconds. Concordia Texas freshman Ravon Davis-Conway (Austin, Texas) placed 15th in the triple jump at the Bobcat Invitational with a leap of 13.59 meters (44 ft.-7 in. ), ranking 29th in NCAA Division III. Hardin-Simmons junior Jessica Eastham (Robinson, Texas) led the Cowgirls in each sprint at the Bobcat Invitational in San Marcos, Texas. She ran the 100-meter dash in 12.55 which ranks 38th in the nation and the 200 meters in 25.82 seconds which is 30th. Eastham also had a 400-meter time of 1:00.62. UT Tyler freshman Summer Grubbs (Gladewater, Texas) ran a 12.41 second time in the 100-meter dash at the Texas Relays, which ranks 24th in NCAA Division III. She also ran the 100-meter hurdles in 15.95 seconds. McMurry sophomore Josie Drury (Alvarado, Texas) placed 30th in the 800 meters at the Texas State Bobcat Invitational in 2:20.68. She also had a 1,500-meter time of 5:05.83, finishing 37th. Concordia Texas freshman Ava Gomez (Port Isabel, Texas) finished third with a personal-best 1:10.97 in the 400-meter hurdles at the Texas Quad Meet in San Antonio. She also ran the 100-meter hurdles in 20.11 seconds. UT Dallas junior Kathy Joseph (Williston, Vt.) was perfect in both singles and doubles play over the weekend as the Comets earned a pair of wins to open divisional play. Joseph made two singles wins at No. 1, giving up just one game total in four sets in victories over Concordia Texas (6-1, 6-0) and Mary Hardin-Baylor (6-0, 6-0). Joseph and partner Sindhu Ravula also collected matching 8-1 wins at No. 1 doubles in the two matches. It is Joseph’s fifth career Player of the Week award. UT Tyler freshman Brooke Brewer (McKinney, Texas) went 2-0 at No. 4 singles and No. 2 doubles for the Patriots. She earned a 6-0, 6-1 victory in singles and teamed with Alexandra McKissick for an 8-1 win in doubles against Ozarks. Against East Texas Baptist, Brewer earned a 6-1, 6-0 win in singles and 8-4 victory in doubles. Concordia Texas freshman Esteban Arredondo (The Woodlands, Texas) won both of his matches and the Tornados’ edged UT Dallas 5-4 to open conference play. Arredondo won at line three 6-3, 6-2 and teamed up with Joshua Bode for an 8-5 victory at line one doubles. Against Howard Payne, Arredondo won at line one doubles 8-1 along with Ethan Espiritu and then rolled to a 6-3, 6-3 line one victory in singles in the Tornados’ 9-0 win. UT Tyler senior Michael Apple (Memphis, Tenn.) posted a 2-0 record at both No. 1 singles and No. 1 doubles for the Patriots. Apple earned singles over Ozarks (6-0, 6-1) and East Texas Baptist (6-0, 6-2) and teamed with Gabriel Hidalgo for doubles victories against the Eagles (8-3) and Tigers (8-0). Hardin-Simmons freshman Jordan Shepley (Wichita Falls, Texas) was 2-0 in both singles and doubles for the Cowgirls. She posted a 2-6, 6-1, 10-5 win at No. 6 singles against Schreiner and teamed with Maddie Hammond for an 8-5 win at No. 3 doubles. Against Sul Ross State, she had an 8-1 singles victory and an 8-1 win in doubles. McMurry sophomore Claire Huffine (Borger, Texas) went 2-0 at No. 2 singles and No. 2 doubles for the War Hawks. She earned a 6-0, 6-1 win over Sul Ross State and a 6-2, 6-3 victory against Schreiner in singles while Huffine teamed with Zayra Gomez for an 8-0 triumph against SRSU and an 8-4 win against Schreiner. LeTourneau senior Katharine Waldthausen (Konigstein, Germany) kept her recent winning streak intact by earning a 6-2, 6-2 straight-sets win at number one singles in LeTourneau’s ASC opening win over Belhaven. The senior also teamed up with doubles partner Maddison Brackenreg at number one doubles for an 8-2 victory. Mary Hardin-Baylor freshman Alondra Torres Diaz (Franklin, Texas) won at No. 4 singles 6-0, 6-0 and teamed with Madalynn Woelfel for an 8-1 victory at No. 3 doubles to help lead the Cru to a win over Howard Payne. Hardin-Simmons senior Griffin Weinkam (Frisco, Texas) won 6-2, 6-1 in both of his No. 3 singles matches on the week over Schreiner and Sul Ross State. He teamed with Holt Fields in doubles for a pair of win over the Mountaineers and Lobos at No. 2 doubles. Mary Hardin-Baylor junior Cole Weiss (Frisco, Texas) won in straight sets at No. 3 singles and No. 1 doubles to help lead the Cru men to a win over Howard Payne to open ASC West Division play. He then fought back from an opening set loss to win a three-set grinder at No. 4 singles against UT Dallas to give UMHB one of its two points in a 7-2 loss to the Comets. UT Dallas junior Giovanni Zamboni (Milan, Italy) was 2-0 in singles play and split a pair of doubles decisions as the Comets opened divisional play with a home split. Zamboni rolled to a 6-1, 6-2, win over Concordia Texas at No. 2 singles Friday in the Comets’ 5-4 loss to the Tornados. 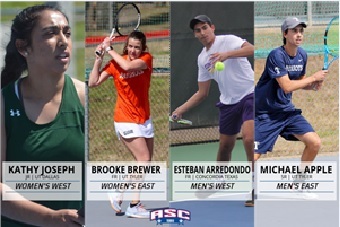 He added a 6-2, 6-0, win over Mary Hardin-Baylor Saturday in a 7-2. Zamboni and partner Mario Jelev also claimed an 8-2 win at No. 1 doubles Saturday against the Cru. McMurry junior Zach Miller (Abilene, Texas) went 2-0 in both singles and doubles play as the War Hawks defeated Sul Ross State and Schreiner. He earned a 6-1, 6-1 win over the Lobos in No. 4 singles and teamed with Trey Fambrough for an 8-0 No. 3, doubles-victory. Miller was responsible for the winning point in a 5-4 win over Schreiner as Miller won 6-4, 6-3 at No. 6 singles. He also teamed with Connor Hogan for a 9-8 (7-2) win at No. 3 doubles. Hardin-Simmons junior first baseman Tyler Bradshaw (Tuscola, Texas) went 7-for-13 (.538) with three doubles, a triple, and a home run while scoring seven times and driving in five runs in the Cowboys’ series win against Belhaven. He hit a go-ahead home run in the bottom of the sixth as HSU rallied from an 8-3 deficit to win 9-8. Concordia Texas sophomore right-hander Michael Smith (Friendswood, Texas) came out of the bullpen for the No. 16/20 Tornados on Friday night against UT Dallas. Smith would shut down the Comets’ offense, allowing only two hits over five innings of work as CTX came from behind to win the game 7-5. He finished the game with six strikeouts to one walk, picking up his third win of the season. Howard Payne senior center fielder Noah Payne (Humble, Texas) slugged .933 while hitting .467 (7-for-15) with a double, a pair of home runs – including an inside-the-parker, six RBI, six runs scored and four steals. He had the walk-off sacrifice fly in the bottom of the seventh of a 5-4 win over Austin as the Yellow Jackets went 4-1 on the week. Mary Hardin-Baylor junior right fielder Landon Dieterich (Riesel, Texas) batted .412 (7-for-17) and slugged 1.000 as the Cru went 4-0. He had two doubles, a triple, two homers and drove in seven runs. He had two multiple-hit games, scored six runs and posted an on-base percentage of .500 over the week. Louisiana College sophomore third baseman Clayton Noakes (Dry Prong, La.) 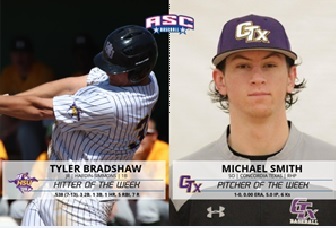 went 9-for-18 (.500) this week for the Wildcats as they won their third straight ASC series. He hit two doubles and two home runs on the week, driving in nine runs and scoring six of his own. He had a .944 slugging percentage on the week and had a 4-for-6 outing with a home run, a double, and five RBI in the Wildcats’ series-opening win over LeTourneau. East Texas Baptist senior second baseman Dylan Sumpter (Tyler, Texas) hit .500 (4-for-8) with a triple, home run, three RBI, two runs and a steal in the series win over Southwestern. He connected with the triple and home run and two RBI in the 6-3 win over the Pirates. UT Tyler senior first baseman Blake Maddox (Jacksonville, Texas) was 3-for-5 with two home runs and five RBI in the Patriots’ 16-11 loss at Southeastern Oklahoma State. Concordia Texas junior second baseman Casen Novak (Flatonia, Texas) had back-to-back three-plus hit performances in the No. 16/20 Tornados’ two wins over UT Dallas on Friday. In the first game of the double-header, Novak went 3-for-3 with an RBI and a run scored as CTX won 7-1. He then recorded a 4-for-5 hitting performance, scoring twice, as the Tornados rallied from a four-run deficit to win 7-5. On the week, he hit .615 (8-for-13) with three runs scored. UT Dallas junior center fielder Jacob Perry (Mesquite, Texas) went 8-for-16 (.500) from the plate while extending his hitting streak to five straight games as the Comets went 1-3 last week. He opened the week with a 2-for-4 performance with two runs scored and a double in UTD’s midweek home loss to Mary Hardin-Baylor. Perry was then 6-for-12 with a double and two runs scored in the Comets’ three-game road series at No. 16/20 Concordia Texas over the weekend. Howard Payne senior right-hander Chandler Clark (Robinson, Texas) opened the series against Sul Ross State with a 5-1 win, holding the Lobos to five hits and two walks to go with six strikeouts over seven innings of work. Mary Hardin-Baylor sophomore righty Andrew Hutchings (Royce City, Texas) took a no-hitter into the seventh inning of a 6-0 victory over McMurry. He finished with a two-hit shutout in his first complete game of the season. Hutchings scattered seven hits over 10 innings and allowed just one earned run in two starts. He struck out two and did not walk a batter while holding two opponents to a .189 batting average. LeTourneau junior right-hander Andrew Robinson (Shreveport, La.) threw six innings, allowing just one run on three hits with seven strikeouts in a 13-1 win over LeTourneau. East Texas Baptist freshman righty Adrian Stover (Cypress, Texas) pitched earned the seven-inning 12-1 win with one strikeout, allowing just two hits against Southwestern. UT Dallas sophomore right-hander Carter Cochrane (Houston, Texas) collected his first collegiate save Saturday as he tossed the final 3.0 innings in the Comets’ 6-1 road win over No. 16/20 Concordia Texas to close out the three-game set with the Tornados. Cochrane struck out five CTX batters while giving up just one hit and a single walk in his longest career outing. Earlier in the week, Cochrane pitched two perfect innings with a strikeout in UTD’s mid-week home loss to Mary Hardin-Baylor. 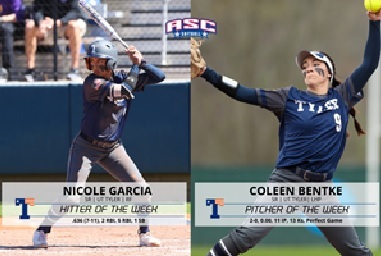 UT Tyler senior right fielder Nicole Garcia (Sugar Land, Texas) hit .636 (7-for-11) with two RBI, five runs scored and a stolen base in the Patriots’ sweep of Belhaven. She went 3-for-4 with two runs scored and two RBI in an 8-0 win over the Blazers. It is Garcia’s second Hitter of the Week award this season and third of her career. UT Tyler senior lefty Colleen Bentke (Brenham, Texas) tossed her first career perfect game and third no-hitter in an 8-0 win against Belhaven to open the series. She struck out nine batters of the 15 batters faced in five innings. In the series, Bentke was 2-0 with 13 strikeouts and only four hits allowed over 11 shutout innings to earn her third Pitcher of the Week of the year and fifth of her career. Hardin-Simmons freshman shortstop Kenzee Hessert (Royse City, Texas) hit .417 (5-for-12) with two doubles, two RBI and three runs scored in the Cowgirls’ series win over Louisiana College. Louisiana College senior center fielder Shelby Bergeron (Morgan City, La.) was 6-for-14 (.429) in the series against Hardin-Simmons with a pair of doubles, a triple, five RBI, five runs scored and two steals. LeTourneau senior catcher Macey Mize (Waco, Texas) led the Yellow Jackets in the series win over Howard Payne, going 5-for-9 (.556) with a triple and a home run for a 1.111 slugging percentage. She also posted six RBI with four runs scored. East Texas Baptist freshman shortstop Hannah Garcia (Houston, Texas) hit .600 (6-for-10) on the week with a double, a home run and five runs scored. She was 3-for-3 in a 5-0 win against Centenary. Garcia also tallied three hits and two RBI in a 5-0 win at Ozarks on Sunday. Mary Hardin-Baylor senior catcher Emily Bounds (Moody, Texas) helped the Cru to a three-game sweep of Concordia Texas, hitting .500 (5-for-10) against the Tornados. Bounds went 1-for-3 in the Cru’s 4-2 win, advancing a base runner with a sacrifice bunt who eventually scored UMHB’s fourth run. She followed that with game-winning RBI in the Cru’s 2-0 victory. Bounds’ RBI-single in UMHB’s 2-0 victory scored the only two runs of the contest. She then hit an RBI-single in the first inning of UMHB’s 4-0 win to give UMHB the lead. Bounds totaled three RBI and one run, recording five hits with no strikeouts. Howard Payne junior right fielder Alexis Sullivan (Brea, Calif.) led the Lady Jackets by hitting .400 (6-for-15) over five games. She had two multiple-hit games at LeTourneau, including a double, two RBI and four runs scored. Ozarks freshman second baseman Paige Lee (Jerusalem, Ark.) went 2-for-3 with a homer and three RBI in a 4-3 win over Hendrix. Hardin-Simmons junior right-hander Taylor Hinojos (Snyder, Texas) pitched a complete game in the Cowgirls’ 9-8 victory over Louisiana College. She struck out four and allowed three earned runs with one walk. Sul Ross State freshman right-hander Jodie Vaughn (Seminole, Texas) posted a 4-0 record, including three straight complete game victories in a series sweep over host McMurry. Vaughn yielded just three hits in a 10-0 shutout win over Howard Payne in a non-conference contest last Wednesday. She then gave up only two singles in a 2-0 shutout victory in the series opener against the War Hawks. For the week, Vaughn recorded 22 strikeouts, posted an ERA of 1.00 and held opponents to a .189 batting average. LeTourneau freshman righty Bailey Richey (Houston, Texas) went 2-0 against Howard Payne with a 2.92 ERA. She tossed a seven-inning complete game in a 6-3 win to start the series, striking out four. Richey also had four strikeouts in a five-inning 14-2 victory to cap the series. East Texas Baptist freshman right-hander Preslye Cox (Rusk, Texas) went 2-0 on the week with two shutouts, striking out 19 batters over 12 innings. She threw five innings of relief with 10 Ks and only three hits allowed in a 5-0 win at Centenary. She then pitched a seven-inning, 5-0 shutout at Ozarks on Sunday with nine strikeouts and five singles given up. Mary Hardin-Baylor freshman righty Kat Reed (Axtell, Texas) threw 11.1 innings against the Tornados, earning a complete game 2-0 win over Concordia Texas and finishing off a 4-0 win. In her first contest, Reed pitched seven innings with three hits allowed and eight strikeouts. She followed that with 4.1 innings of work, allowing just two hits with five strikeouts. Reed did not allow a run in either contest and walked only one batter over both games. Howard Payne senior right-hander Audrey Simpson (Cuero, Texas) improved to 7-4 on the year with a conference win at LeTourneau. Simpson threw 5.1 innings in the start allowing just one run while striking out one and walking none. Ozark’s freshman righty Candace Rogers (Batesville, Ark.) pitched two keys innings in relief to pick up the win against Hendrix. For the week, she was 1-0 with a 3.88 ERA with four strikeouts in 7.2 innings over three relief appearances.